current lenses or whether a change in prescription or lens type may suit you better. Up to date contact lens designs are always developing so an annual check up ensures that you never miss out on the newest lens available. 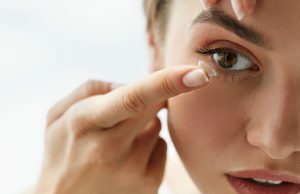 When fitting contact lenses soft contact lenses tend to be the more popular type, due to their comfort and the fact that they are suited to the majority of people. They range from daily disposable where you put a fresh lens in every day to monthly where you take them out at night and re use them for a month. We can also fit gas permeable lenses as well as other specialist contact lenses which are designed for more complex prescriptions. If you have astigmatism, we use ‘toric lenses’ which are specially designed to fit to the shape of your eye.